Maho Bay Campground is a legend among eco-travelers. So what'll you find at Maho? For starters, getting there is an adventure in itself! You reach the campground along the windy, hilly North Coast Road. You turn off this road onto an even hillier, windier road that demands a rugged vehicle (or some good hiking shoes and strong legs!) I definitely recommend four wheel drive. The campground itself is spread over a steep, forested mountainside overlooking... you guessed it... Maho Bay. There's a main office/registration area with an open-air pavilion restaurant. 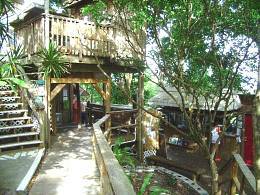 From the main office you reach the tents and bathhouses along raised wooden walkways that wind along the hillside. Maho is a big place! The walkways total about three miles. This is a hilly, steep location, so you'll encounter lots and lots of steps and slopes. The staircase leading down to the beach is 162 steps long! You'll get some great exercise coming back from swimming or snorkeling. The campground was started in 1976 through the vision of founder Stanley Selengut. His idea was to create a destination that offered great appeal to travelers while minimizing impact on the pristine environment of St John. 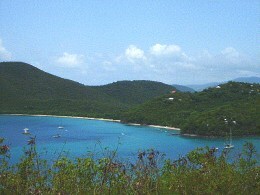 Maho began as 18 tent-cottages surrounded by the lush beauty of the Virgin Islands National Park. Since then, the campground has expanded to 114 tents. The tents are canvas-covered wood frames, built on 16-foot square wooden platforms. The platforms are raised above the ground on wood pilings. The design reduces erosion of the forest floor and the harmful sediment runoff which destroys coral reefs. Hand construction was used in place of heavy machinery to avoid damaging the surrounding terrain. The tents themselves are divided into sections, and all have an open deck area. They come equipped with electric lights, fans and outlets, two twin beds with mattresses and linens, and a couch, as well as a table and chairs and storage shelves. You also get an ice-chest, basic cooking and eating utensils, and a propane camp-stove. Many of the tents and walkways afford beautiful views of the sea below. There's a beautiful white-sand beach with very good snorkeling. Maho Bay Camp offers many activities, including sailing excursions, scuba diving and snorkeling, and power-boat tours to remote beaches on the British Virgin Islands. You'll also find a wide selection of great arts and crafts programs. Don't miss the glass blowing demonstrations... they turn crushed bottles into beautiful vases, plates, bowls, and all sorts of decorativeitems. You can also take part in a variety of special programs and retreats. So, is Maho Bay for you? That definitely depends on your tastes and preferences. This is, after all, a campground, not a hotel or luxury resort. You'll be right in the thick of nature. You'll need to negotiate winding walkways and steps in the dark (a flashlight is an absolute must... bring at least one per person... I recommend two). Bathhouses are communal, and you won't get any hot showers here. You'll also need plenty of insect repellent, and even with it, you'll still end up with lots of itchy bites on your feet and ankles from the no-see-'ums (sand fleas). When you stay at Maho Bay Camps, you'll be surrounded by the unspoiled jungle. You'll see lizards dashing along the boardwalks and up the walls of your tent. You'll fall asleep to the chorus of tree frogs that chirp all night, every night. So should you stay at Maho or not? If you want luxurious, impeccable accommodations, lots of service, and all the creature comforts, forget it. You won't get them at Maho. On the other hand, if you want to get close to nature in one of the most beautiful spots on earth, while getting plenty of environmental food for thought, Maho Bay is a fantastic destination. Special Note: Persistant rumors have it that the campground's lease will be expiring in early 2012. So if you want to go, go soon! For rates and contact information, go to our St John Hotels page.